Reefer madness isn’t a thing. But a new study out Tuesday is the latest to show that pot use, especially with edibles, can sometimes cause health problems serious enough to prompt a trip to the hospital. It found that people in Colorado have increasingly sought emergency care for cannabis-related symptoms like anxiety, rapid heartbeat, and a strange syndrome characterized by intense vomiting since recreational cannabis was legalized in the state. Colorado passed an amendment to legalize cannabis fully in 2012, and began to allow sales of it in 2014. So the researchers behind the study, published in Annals of Internal Medicine, looked at medical records from patients who visited the emergency department of the UCHealth University of Colorado Hospital from 2012 to 2016. These visits had all been initially diagnosed as related to cannabis use, with nearly 10,000 such visits documented between those years. During that time period, they found, cannabis-related visits shot up more than threefold. Roughly a quarter of these visits (27 percent) could be directly attributed to using cannabis, they also estimated. And while people more often ended up in the hospital from smoking pot, pot edibles were more likely to cause problems. Edibles also seemed to cause more serious side-effects. 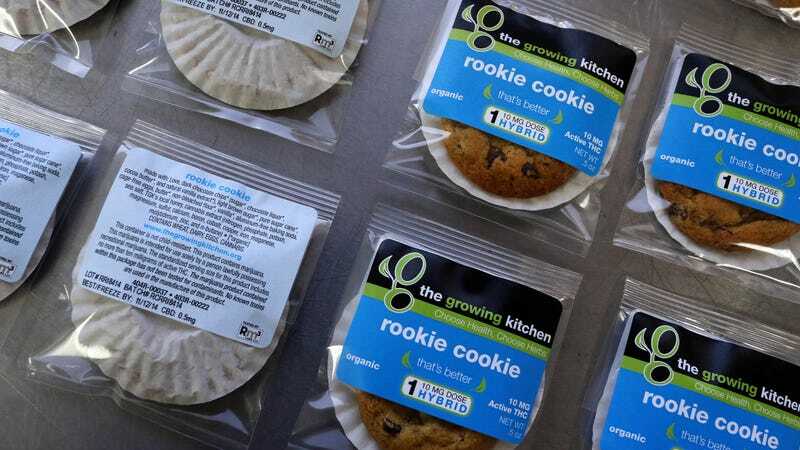 Eighteen percent of visits related to edibles featured acute psychiatric symptoms—including panic attacks or bouts of psychosis—compared to 10 percent of visits for inhaled cannabis, for instance. Edibles were also more often associated with intoxication (48 percent vs. 28 percent for inhaled pot) and cardiovascular symptoms (8.0 percent vs. 3.1 percent). At the same time, smoking pot was associated with a greater rate of people needing hospitalization for their symptoms. One major reason was the higher incidence of cannabinoid hyperemesis syndrome (CHS), a condition that causes horrible stomach pain, repeated vomiting, and the compulsion to take hot water showers (sufferers say the hot water soothes their symptoms). Because the findings were based on visits to a single, if large, hospital in Colorado, we don’t know for sure yet that pot-related ER visits are on the rise everywhere that cannabis is becoming legalized. The observational nature of the study also can’t tell us if someone’s symptoms, including psychosis, were actually caused by cannabis use, only that the two things are linked. Research has gone back-and-forth on whether people with a predisposition to mental illnesses like schizophrenia are more likely to develop psychiatric symptoms if they use cannabis. That said, it’s definitely true that most people who use cannabis will never go to the ER as a result. CHS in particular is thought to be incredibly rare, seemingly only happening in people who use cannabis heavily, and its frightening symptoms go away as soon as the person stops using cannabis. But the findings do suggest that people’s unfamiliarity with edibles, which can take hours to fully kick in, can lead them to take more than they should and make them sick, the authors said. They added that more needs to be done to study the potential harms of edibles and cannabis generally, including its connection to mental health problems.